Posted on Wed, Mar 7, 2012 : 1:51 p.m.
A software company that recently secured a $5 million venture capital investment is moving its Jackson office to Ann Arbor to capitalize on the local talent pool. Commerce Guys, which also has an office in France, plans to shift its Michigan operation to Ann Arbor within months and plans to expand the office from 14 to 30 people by the end of the year, said Mike O’Connor, co-founder and president of North America. Michael O'Connor, president of Commerce Guys in North America, said the company would add about 16 jobs to its 14-person Michigan office by the end of the year. The company, which has developed a version of an open-source content management system called Drupal for e-commerce applications, reported that the number of websites running its software recently surpassed 10,000. O'Connor said the company needs software developers to help it maintain its pace of growth — and that the Ann Arbor area offers a better chance than Jackson to recruit that talent. "We've got a very aggressive growth strategy," O'Connor said. "The e-commerce market is really waiting for a great open-source solution." He cited the talent generated by the University of Michigan as a key reason for the company's decision to locate here. He also said the company was lured by discussions with economic development group Ann Arbor SPARK about a Michigan Economic Development Corp. program called Shifting Code, which offers computer programming training to individuals looking to make a career transition. 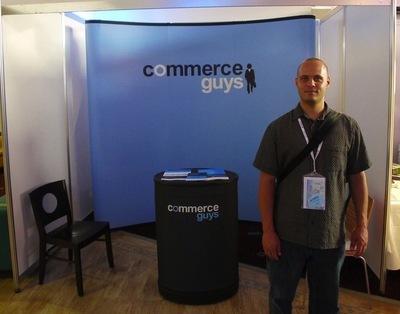 Commerce Guys, officially founded in Jackson in 2008, recently landed $5 million from Paris-based Alven Capital, Finland-based Open Ocean Capital and Paris-based ISAI, which invested $1 million in 2010. The company has 37 employees split between its Paris and Michigan offices. Commerce Guys executives said they've already toured vacant offices in the Briarwood Mall area. O'Connor said the company would likely sign a lease for a space in the "I-94 corridor" because it's accessible from the Jackson area, where most of its employees live. Commerce Guys has leveraged an open-source platform — that is, a software program that can be tweaked for free and for commercial purposes — to manage the development of a customizable digital sales system for online products. O'Connor said the company's software, dubbed Drupal Commerce, is free — but the company gets revenue by charging large users for support services and consulting. "A lot of times the feedback we get from merchants is they're tired of making business decisions based on what their e-commerce framework can do," O'Connor said. "What we've done is created a really powerful e-commerce framework that enables merchants to deploy stores." Sat, May 26, 2012 : 7:28 p.m. I contacted Shifting Code multiple times, and I have received no response. I'd like to be part of something like Shifting Code. However, I would like the administration of it to be responsible. The last time I contacted shifting code was months ago. I did not receive a response. Mon, Mar 12, 2012 : 8:05 p.m.
Get them into the Border's space downtown! Thu, Mar 8, 2012 : 10:53 a.m.
Thu, Mar 8, 2012 : 2:31 a.m. I have mixed feelings about this news. While the business may be good for Ann Arbor, I'm sorry Jackson is losing a business. I'm an Ann Arborite. Ooh la la I love the paris connection ;-) You know what I've noticed, by the way, about french online commerce of the touristic sort?! They do good web sites, even for small operations, it seems to me. Maybe this is completely irrelevant to the issue at hand, but maybe companies like commerce_guys do stuff that we can all benefit from here in the US (and Ann Arbor of course). And thank goodness they seem to be neither SEO-salesmen nor 'social media/marketing' people, woohoo! Wed, Mar 7, 2012 : 11:04 p.m. Wed, Mar 7, 2012 : 9:32 p.m.
Another Ann Arbor e-commerce company. Hmm. Good luck finding senior tech people. We're going to have to start importing them to fill all the openings around here. Not that this is a bad thing. Fri, Mar 9, 2012 : 4:14 a.m.
@Dave Jansen It's not a question of finding architects. A good architect can make six figures, and I rarely see that number in local job postings. People are living in a dream world where the news about the recession makes them think they can get talent cheap. If poaching is a problem, then you're not paying market rates with perks that would help you with retention. Thu, Mar 8, 2012 : 5:20 p.m.
@Dave Thompson Only 20%? SF has about the highest cost of living in the U.S.
As a senior systems guy that recently emigrated from Ann Arbor to the SF Bay Area for work, there just are not the opportunities back home. If I could get a job in Ann Arbor within 20% of my current pay, I would be extremely interested. In fact, that's why I was reading this article in the first place. Thu, Mar 8, 2012 : 3:18 p.m. Between the local e-commerce companies there is quite a bit of poaching. Also, if you are finding senior (system architecture level) people with ease, then you're in the minority around here from what I can tell. Thu, Mar 8, 2012 : 3:39 a.m. I haven't seen the upward pressure on wages and the rampant poaching that's indicative of a shortage of talent. We're just starting to see some pressure on the heavy lifting type work, which Drupal/PHP isn't, so I think they will do fine between their incentives and the type of skills they are seeking. Wed, Mar 7, 2012 : 8:43 p.m. This is great news for Ann Arbor! Wed, Mar 7, 2012 : 8:23 p.m.
if you want to hire young talent, you should try to stay as close to downtown as possible - Avis Farms and Dominos has a harder time drawing people as they would rather work downtown.